LOCTITE® 8009 for heavy duty applications is a good example of this new breed of the metal-free anti-seizes now available. It replaces metal fillers with those that are mineral based. As a result, it can be used on all metals and is also able to withstand temperatures up to 1315°C, providing maintenance engineers with a high performance anti-seize for all applications. It lubricates the surface, protects against corrosion and also resists high pressure. It has become a popular toolbox product because it is truly universal in its application and also very easy to apply. 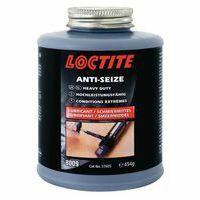 Generally anti-seizes are supplied in cans or as aerosols but LOCTITE® 8009 was one of the first to be available in a screw-capped can with integral brush to allow precise application. And now Henkel has also introduced LOCTITE® 8009 in a brush-top tube too which ensures a cleaner application and waste reduction.